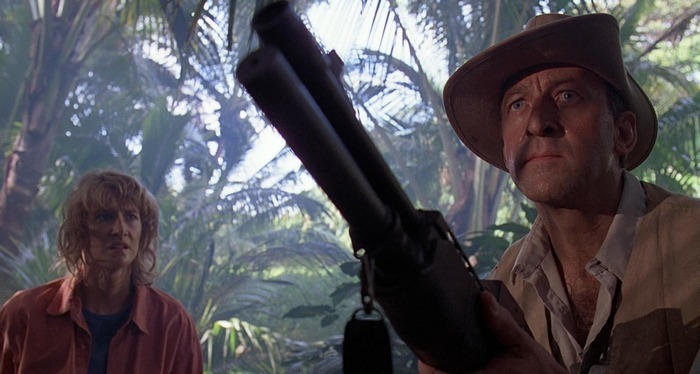 This article includes various Jurassic Park Deleted Scenes that were seen in the original script but was deleted before filming began or during post-production. 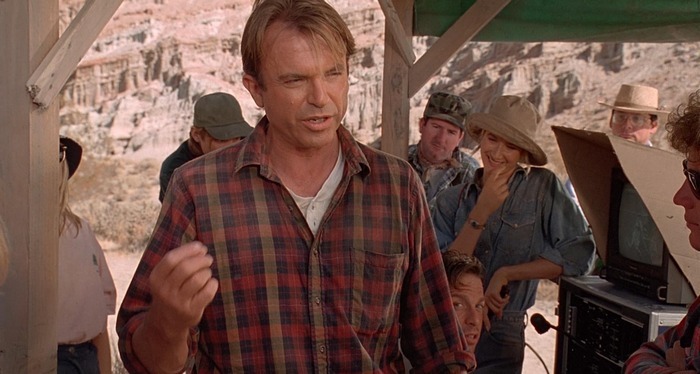 In the original script, there was going to be a bit more background to Dr. Grant and Ellie at the dig site. It was going to make their romantic relationship a bit more clearer to the audience and there was going to be more discussion about the intelligence of Velociraptors. This scene was mostly likely cut due to pacing issues. In the Jurassic Park comic adaptation, there is additional dialogue between Ian Malcolm and Dr. Grant and Ellie. They question Malcolm why he thinks the project on the island will fail and says “Hammond’s project is an apparently simple system, but chaos theory explains that simple systems will inevitably produce complex behavior,”. This dialogue wasn’t in the shooting script though. 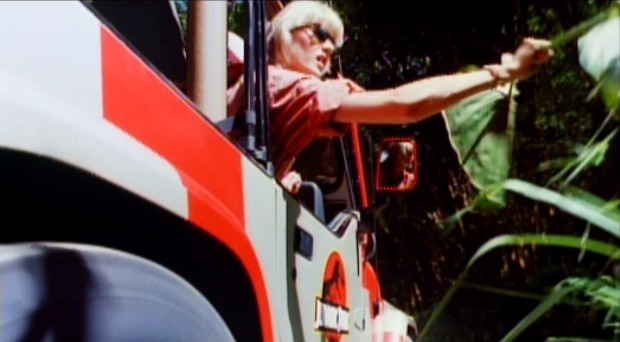 A short scene was seen in the Jurassic Park trailer where Ellie grabs a plant leaf that she talks about later in the film. by, TEARING it from the tree. There was a deleted scene where you can see the two Ford Explorers coming out of a garage at the back of the visitor’s center. The cars slowly drive themselves on a semi-circular turn and stop before the tour party. The other half of this scene is available on the DVD but it doesn’t show where they came from. middle of the road. They pull to a stop where the group is gathered. When Dr. Grant tries to force the door of the laboratory open, Gennaro tries to stop John Hammond from letting them into the lab. There was also more dialogue of Malcolm telling Ellie why the park will fail. 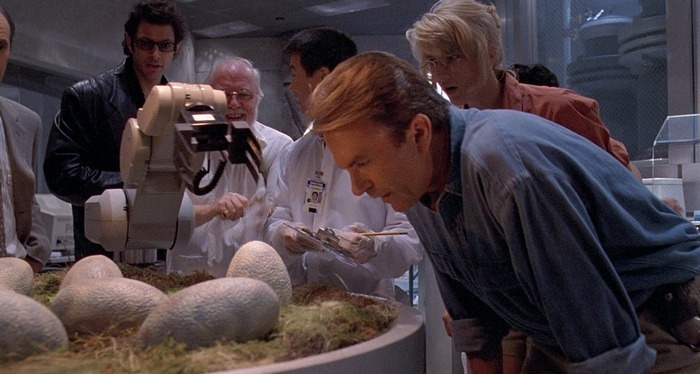 When the group are in the lab, originally a Triceratops was going to hatch out of the egg but this was changed to a Velociraptor so the scene could lead to the Velocirpators’ enclosure. Why are the kids here? 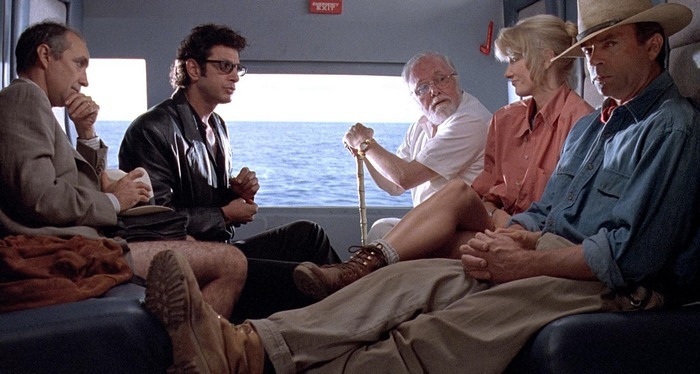 There’s a scene where John Hammond explains to Dr. Grant, Ian Malcolm and Ellie why Tim and Lex are here at Jurassic Park. He says their parents are going through a divorce at the moment and wants the group to understand that. He says: “Have a heart, gentlemen. Their parents are getting a divorce and they need a diversion. Maybe they’ll get you into the spirit of this place.” This scene was filmed and you can see this scene in behind-the-scenes footage. 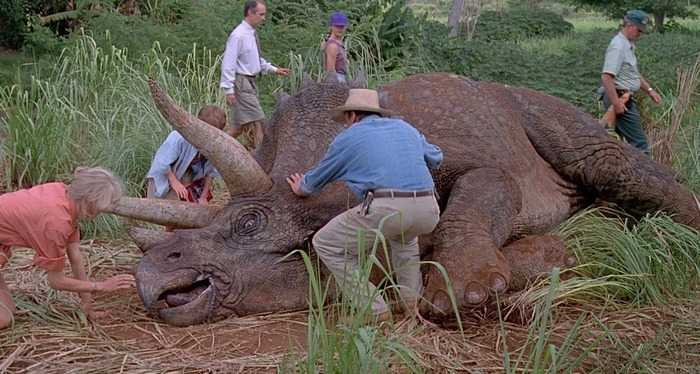 There was originally going to be an explanation as to how the Triceratops got sick in the first place. Tim was going to find some rounded stones by the West Indian Lilac plants that made the creature sick. Dr. Grant and Ellie then suggested that when the Triceratops eats the stones (for grinding its food), it ate the poisonous berries at the same time. This explanation was in Michael Crichton’s novel too except it was a Stegosaurus instead of a Triceratops. 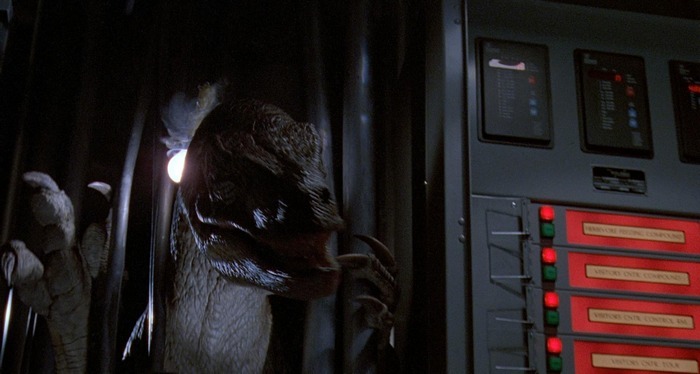 In an interview with Encore Movie Network’s The Directors special, Jeff Goldblum said Malcolm was going to cowardly run away like Gennaro did when the Tyrannosaurus makes its first appearance. Goldblum persuaded Spielberg for his character to be more heroic by trying to distract the creature with a flare. 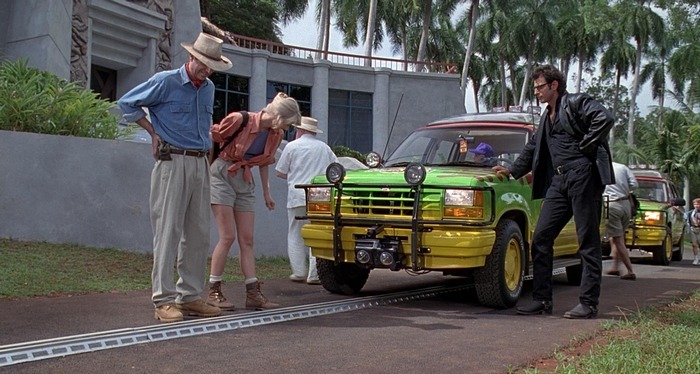 After Dr. Grant and the children avoid being crushed by the Ford Explorer, there were originally three different versions of when Dr. Grant and the children wonder into the jungle. He convinces Lex that she is much safter with him and Tim. In another version, it’s revealed that Grant has a map of the island which explains how he was able to get back to the visitor’s center. There were a couple of production stills showing a much longer journey that Dr. Grant and the children would have had across Isla Nublar when they were trying to get back to the visitor center. There were also plans to film other scenes in the river raft sequence like when Grant and the children see a sleeping Tyrannosaurus and it swims after them. Another part of the sequence had the group hiding behind a waterfall and the T-Rex licking them. All these scenes were used in The Lost World and Jurassic Park 3. In the script, there’s a scene where Muldoon and Ellie carry Malcolm on a stretcher down a narrow path in the compound. This scene happens right after Ray Arnold goes to the power shed to restore the park’s power. There was a shot showing where Muldoon and Ellie was going to go when they had to get to the power shed to restore the park’s systems. 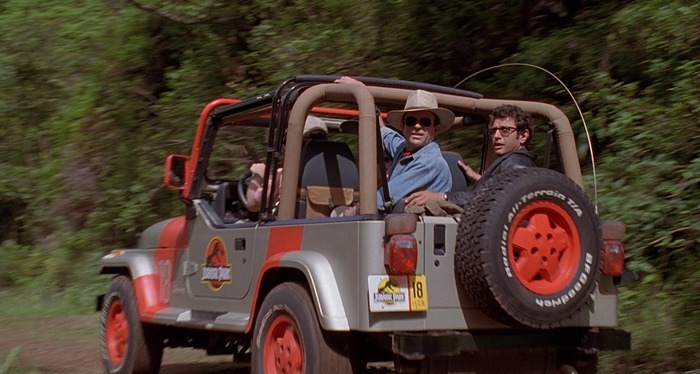 It was featured on the Beyond: Jurassic Park DVD with the DVD Boxset. In the scene where Ellie is in the power shed after restoring the power, she is actually grabbed by a Velociraptor. In the film, it just appears behind her. There’s some more dialogue when Ellie finds Dr. Grant after exiting the power shed. She calls out to Grant telling him to run towards the bunker and she asks where the children are. going. From far off, he hears someone SHOUTING to him. waving to him, SHOUTING something too faint for him to hear. He furrows his brow and walks towards her. She SHOUTS louder. races up, and she runs into his arms. According to some people’s accounts, a scene was shown in the theatrical release where the Tyrannosaur crashes into the visitor center’s wall though this has never seen on the subsequent DVD releases. 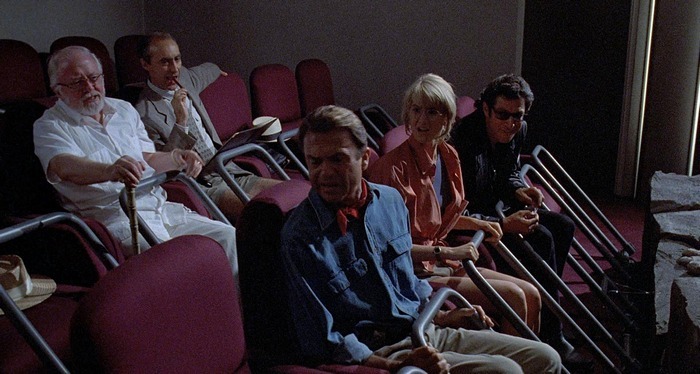 There were two different endings planned before the Tyrannosaur killed the Velociraptors in the visitor’s center. 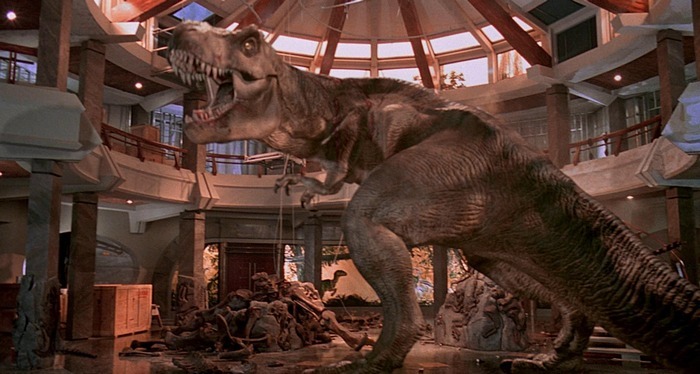 Originally, Dr. Grant was going to crush the raptors with the dinosaur skeleton. Another version was going to have Hammond shooting the raptors before they attacked the survivors. 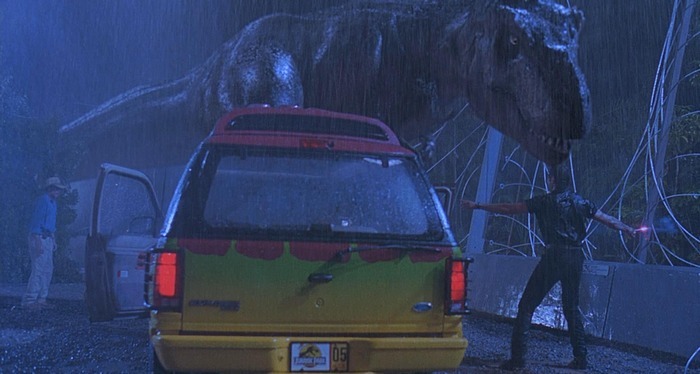 Director Steven Spielberg changed it as he wanted the T-Rex to be the star of the film. It falls directly onto the last raptor, squashing him flat. Dead.